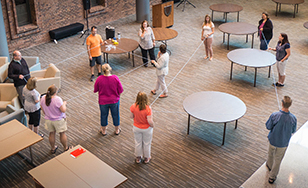 Workshop participants practice an interactive activity to do with students to help teach polygon rules. They were shown several examples of ways to make learning more hands-on for their students. St. Scholastica faculty members recently hosted a seven-day workshop aimed at helping local math teachers sharpen their skills to maximize student engagement. The Duluth News Tribune stopped by to provide a closer look at the event. The program, "Engage, Learn, and Connect Math Topics Course," was funded by a $45,240 grant from the Minnesota Office of Higher Education. It engaged Duluth-area elementary and middle school mathematics teachers in high-quality learning and reflection to improve their teaching skills and capacity. -and providing ideas for the effective use of technology. Kirk and her St. Scholastica mathematics department colleagues Guanshen Ren and Luther Qson conducted the workshops. The College is also involved in a series of other efforts aimed at fortifying STEM education. This is a key issue in Minnesota and beyond, as school districts across the country are facing a shortage of STEM educators. -The College is implementing a five-year, $1.2 million grant from the National Science Foundation to increase the number of new math and science teachers committed to teaching in high-need districts in Minnesota. -The College recently received separate National Science Foundation support for a program that educates K-12 teachers on how mobile app development can be used to teach computer science. A supplemental grant of grant of $300,000 brings total NSF grant funding for this project to $1.3 million. -Last summer, Kirk and colleagues created a STEM summer program for local middle school students, using a $15,000 grant from the Lloyd K. Johnson Foundation. -St. Scholastica students and faculty frequently visit Lowell Elementary School to work with students on interactive science projects.